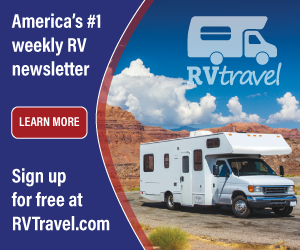 To extend the life of the inner tank and to eliminate the buildup of mineral deposits inside the water heater, backflush the heater two or three times a year, especially at the start of the RVing season. This is helpful when you travel extensively and encounter a varying quality of water. Mineral deposits settle to the bottom of the tank, so simply draining the tank will not usually rinse out these deposits. 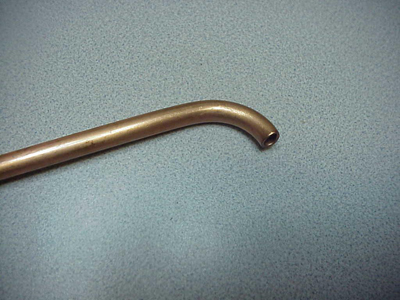 A copper tube with a short bend on the tip, a handy tool available at RV supply centers, can help remove mineral deposit buildup. 1. Make sure all energy sources to the water heater are turned off and that the water inside has cooled. 2. Turn off all sources of water pressure; the on-board pump and the city water connection. 3. 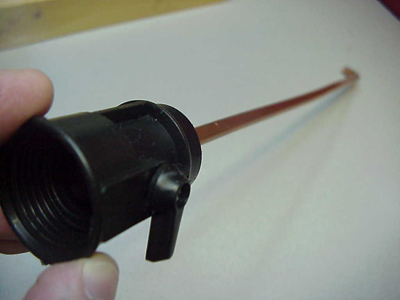 Drain the water heater by opening its drain valve (or removing the plug/anode). To aid in draining, open all hot water faucets throughout the RV. 4. If water barely trickles out of the drain, remove the drain valve completely (if so equipped) and carefully insert a straightened coat hanger into the drain opening in the tank to help break up any calcified deposits. Thoroughly flush out the tank using the tool in the photos above. 5. Close all hot water faucets opened earlier and turn on the city water or the water pump (the higher the pressure, the better). If a pressure regulator is normally used in-line with the city connection, temporarily remove it for this step. 6. Open the pressure and temperature relief valve, (P&T), and allow water to gush from the drain opening as fresh water rushes in. 7. Allow this flushing to continue for five to ten minutes. This will remove any stagnant water along with any residual mineral deposits that may remain. 8. After about ten minutes of flushing, turn off the water source, reinstall the drain plug/anode (or close the drain valve) and close the P&T valve by allowing the lever to snap shut. 9. Turn on a water pressure source once again and open all the hot water faucets inside the coach until water flows freely from all hot faucets. 10. Finally, turn off the water source and all but one of the hot faucets, then open the P&T valve once more to release any water and to establish a cushion of air on top of the water in the water heater. When water stops dripping from the P&T valve, close it and the last hot faucet inside the RV. The heater is now prepared for use and you can begin the heating cycle.